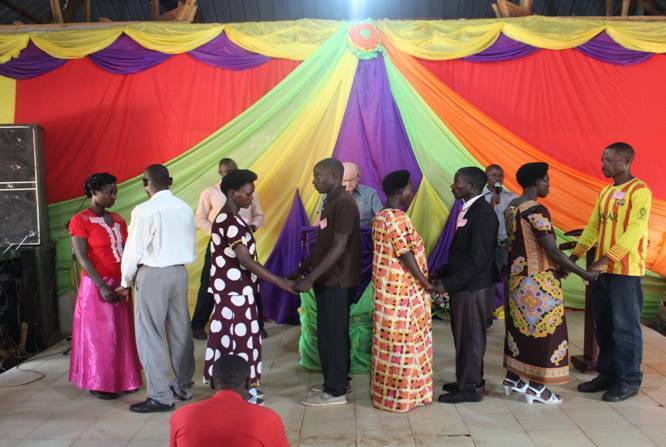 The 70th and 71st ALIM pastors and leaders conference was held in the towns of Bukomero and Ntwetwe in the districts of Kiboga and Kyankwanzi respectively. In Bukomero the conference was held at Miracle Centre church hall from 31st to 3rd June 2017 and the one in Ntwetwe from 5th to 8th June 2017. 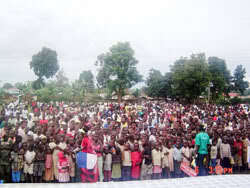 The conference attendance in Bukomero was approximately 600 and that of Ntwetwe was 720. . 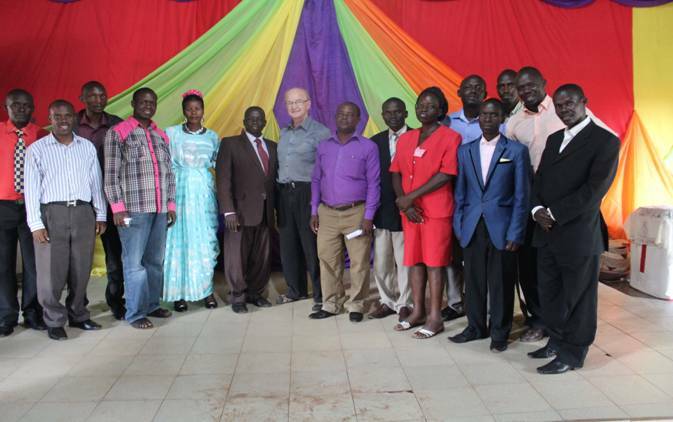 The ALIM team composed of Pastor Ernest Howie, the team leader, John Faith a teacher, Samuel Sombi the Missions coordinator, Godfrey Kalungi a praise and worship leader, Henry Habyamukama, the prayer leader and Jimmy the sound technician. ALIM believes that if the church of Jesus Christ walked in the fear of the Lord and intertwined it with walking in integrity, it will be able to stand against any form of storm. The fear of the Lord and integrity are a true foundation for the church and a vital component of a victorious Christian living. The teachings pointed to the main theme of the conference as recorded in Hosea 4:6—“My People are destroyed for lack of knowledge”; Mal.2:7—“For the lips of a Priest should keep knowledge, and People should seek the law from his mouth; for he is the messenger of the Lord of hosts”; Ps. 25:4-5—“Show Me your ways, O Lord; teach me your Paths, lead me in your truth and teach me”; Ps. 43:3—Oh send out your light and your Truth! Let them lead me: let them bring me to your holy hill and to your tabernacle. CONFERENCE DETAILS The conferences were both residential for participants from far towns and rural areas and those who live nearby came from their homes. The resident participants in Bukomero were 200 and 370 were nonresidents, while in Ntwetwe, 400 were residents and 300 commuted from their homes. The residents arrived a day earlier so that they settle in prior to the start of the conference. All the three main meals ie breakfast, lunch and dinner were provided to the participants by ALIM through the hire of local catering services who prepared and served the meals. EFFECTIVENESS OF THE TEACHINGS The teachings generated a lot of interest from the participants and this was exhibited in their response to the word. As a result of the teachings, many participants yielded to the baptism of the Holy Spirit. Many believers who were prayed for were baptized in the Holy Spirit and this was evident by many who spoke in tongues for the first time. In response to the message entitled “church and community”, many people were touched and they demonstrated their faith in a practical way. The participants collected items worth Ugs 1, 150,000 and distributed them to the needy persons in the community as well as in the hospitals and prison. 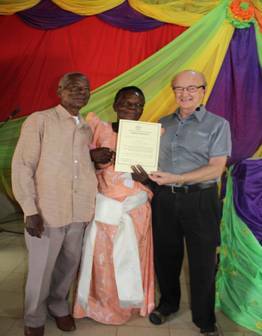 During the conference in Ntwetwe, a couple gave their lives to Jesus Christ. In spite the fact that the conference was for Pastors and leaders, therefore presumably all born gain, God had good intentions for this couple. After being led into a prayer of confession receive Christ, the couple was handed over to the local leadership for discipleship. During the conference, Pastor Henry gave a testimony about his experience with ALIM and how the conference that was held in his home town of Kasese in March 2016 has impacted him, the church and the entire body of Christ in the town. In his brief, he testified that pastors of the town have resolved to minimize big and expensive weddings by embracing simple and affordable budgets. He sited one couple who just used Shs 400,000 for a wedding. Since March last year, many churches in Kasese have community service money collection bags every Sunday. 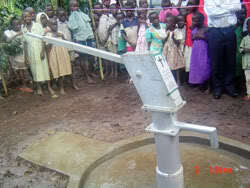 The money is used to buy food items for the needy in the community as well as other acts of mercy. Before the conference, many pastors were receiving a tithe without it going through the church accounts. 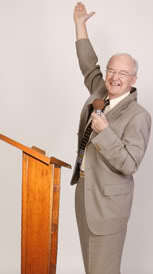 But during the conference, the leaders were taught that the tithe is not for a pastor, but for the store house. This literally means that the tithe has to be brought and received by the church treasury and out of it, a pastor receives his pay. Pastor Henry testifies that the churches that have embraced that teaching on tithe has seen a tremendous increase in church income, including his own church. 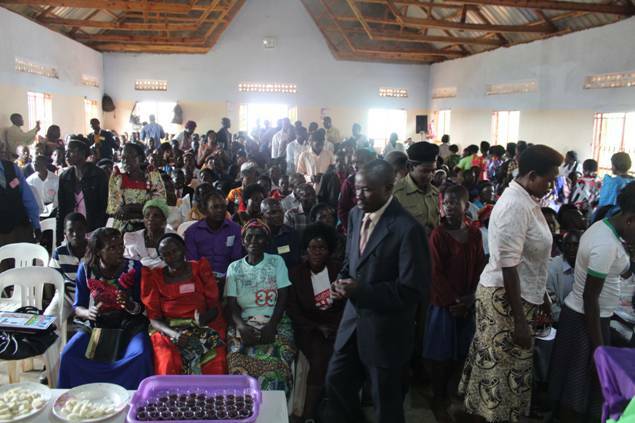 The pastors and leaders in the towns of Bukomero and Ntwetwe appreciated the soundness of the teachings and invited ALIM to return to their towns to continue with the same. 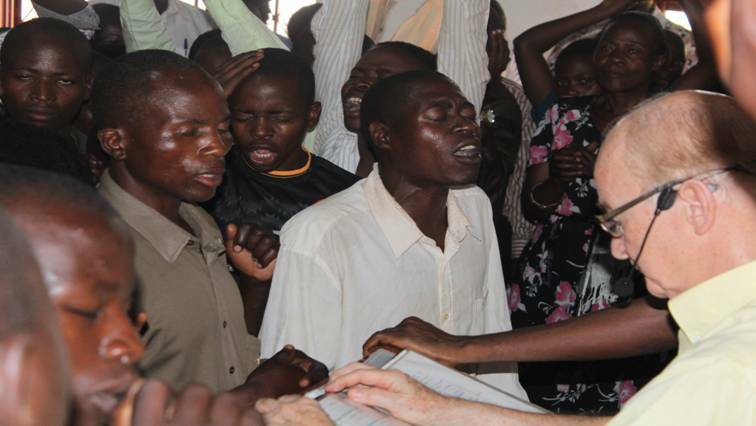 In the same accord, there were pastors from Mubende and one Missionary couple from Rwanda who extended the invitation to ALIM to go and carry out teachings in their towns respectively. The teaching on the sacrament of Holy Communion signified the importance of the church as one with a mission and purpose to bring glory to God. The cup signifies blood for the forgiveness of sins of all mankind and the bread represents the body of Jesus Christ; a symbol of health and wholeness for all believers. …. “By His stripes, we are healed”….Isaiah 53:4-5. After the communion, the pastors and leaders were commissioned to go and serve the Lord with zeal, Knowledge and understanding, furthering the sacrament of communion till Jesus’s return. 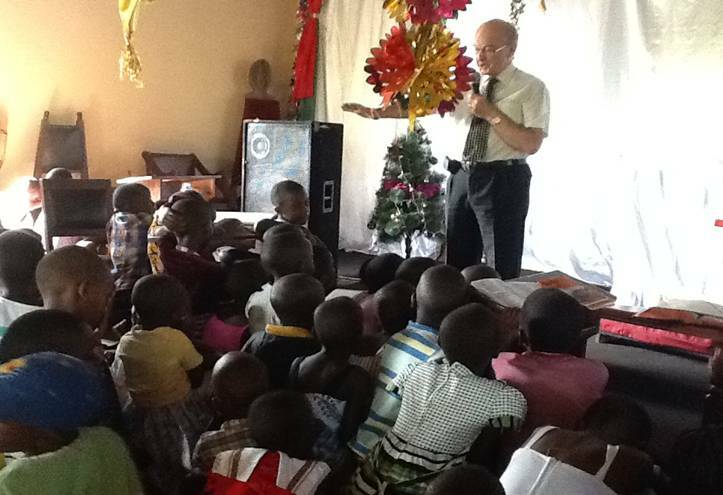 On Sunday the 10th Pastor Ernest ministered in St. James Anglican Church-Bugema in Mbale district. Besides preaching in the two, Holy Spirit filled, power packed services, he dedicated three new born babies to God. This was besides the dedication of the children of Sunday school going age. After the message “submit to God-Resist the devil and he will flee….” James 4:7 among other points, Pastor highlighted forgiveness as an indicator of submission to God. After the service, two people testified that they discovered the need to forgive though what they had gone through was very hurting. In the prayer of meditation after the sermon, they forgave those who had hurt them and by the end of service, they were free and free indeed. Pastor Ernest also visited My Father’s House Primary school where he met the children and the staff. During his meeting with the staff, Pastor encouraged each member of staff to be dependable and hard working. He reminded the staff of the motto for My Father’s House which is obtained from Colossians 3v 23 “whatever you do, do it heartily as unto the Lord” Pastor thanked Mr. Isaac Obala in a special way with a token of appreciation for working well as an acting Head teacher while Aidah was on maternity leave. He encouraged all other staff to emulate Isaac’s example of being dependable and hard working. Besides meeting the staff and the children, Pastor met the Board of Governors for the school where he discussed with them issues of proper management of the school with a business perspective. 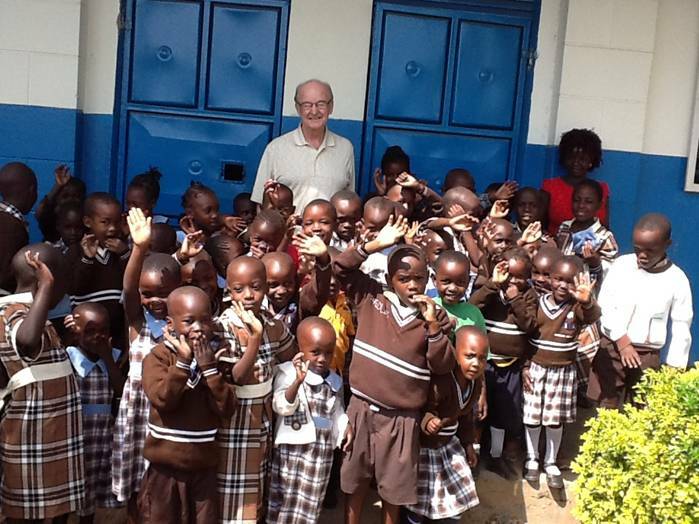 Pastor Ernest in a photo with Children at MFH. Thanks to the Almighty God who enabled the ALIM team to be true to the calling to equip the church with the truth of the Word of God. All gratitude is ascribed to the Almighty God for enabling Pastor Ernest Howie and the team to make the conference a success along with the coordinating teams in Bukomero and Ntwetwe. We appreciate the leadership of St, James church for inviting Pastor to teach the congregation the word of God. To those looking after the affairs of MFH, both the children and the staff, blessings.